At Eccleston St. Mary's, we are very proud of our sporting traditions. We run sports teams throughout school for our elite athletes, but we also have an inclusive approach, whereby we make it our aim that by the end of Y6 every child will have represented the school at least once in a competitive sporting event. Thanks to the enthusiasm of our staff and pupils, and especially our PE Co-ordinator, Mrs Rodofile, we have been awarded the Sainsbury's Gold Award for school PE. 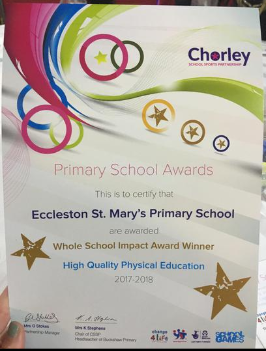 In addition, much to our delight in July 2018 we were recognised by Chorley Schools Sports Partnership and were awarded their major award for 'Whole School Sports Impact.' 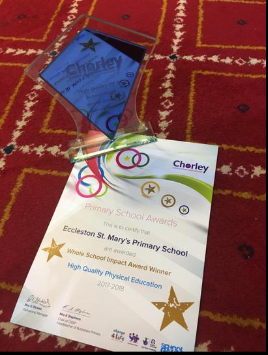 This recognised our dedication towards involving all staff and pupils in sporting activities throughout school.